Professor Karl-Heinrich Engesser from the Department of Biological Waste Air Cleaning of the Universität Stuttgart (Germany) is a visiting professor in the GI2AM group of the Universitat de València. This stay is financed by the Generalitat Valenciana (autonomous government of the Valencian region) under the project Prometeo 2013/053. Within his activities in the Gi2AM group, professor Engesser gave a very interesting presentation about microbiology applied to VOC removal by biological waste air purification. 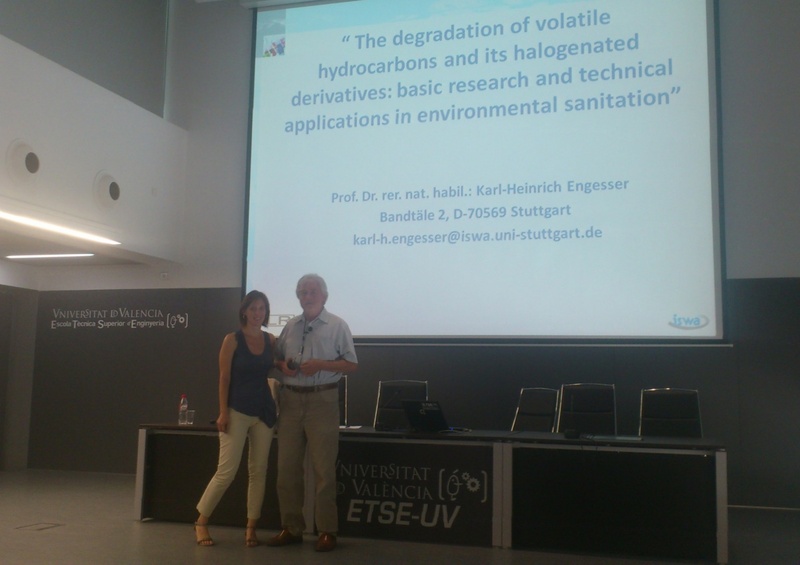 Researchers from the GI2AM group and students from the Universitat de València attended the presentation, which took place in Saló de Graus Joan Pelechano, (ETSE, Universitat de València) on 27th of September.